Omega Environmental Technologies and Santech Automotive A/C Components, along with Global Parts Distributors, are the three companies that make up the Omega Group. Santech lead the way in this group, founding in 1971. Santech is a leading distributor of small mobile A/C parts. The company also provides a complete line of switches, sensors, resistors, sealants, fittings, chemicals, and tools. Omega Environmental Technologies was founded in 1989 and complements Santech with a complete line of compressors, evaporators, condensers, expansion valves, receiver driers, hose fittings, and systems. Global Parts Distributors, founded in 1973 in Macon Georgia, specializes in supply chain technology to insure the parts in need are made available on time, and at a low cost to the customer. Collectively, the Omega Group employs 140 people and is ISO 9001:2008 Certified. 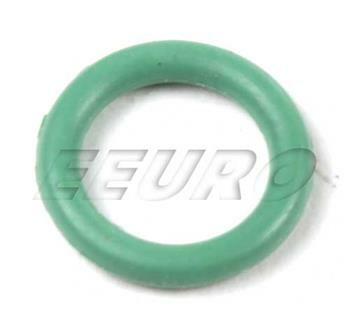 If this is not the exact A/C O-Ring (10 x 8mm) you are looking for, or you would like this part in a brand other than Santech, please contact us and one of our customer service experts will help you locate the exact part you need. Kits items from eEuroparts.com® can save you significant time and energy both shopping and installing. Below you will find kits containing this item. Click a year range, make, and model below for additional information. eEuroparts for Life™ is a concept that includes a loyalty program, a limited lifetime warranty, and commitment to service designed to earn your business and then keep you as a customer for the lifetime of your European vehicle. Any items marked as eEuroparts for Life™ will be warranted to the original purchaser for the duration of your ownership. If a part fails, the original purchaser is able to return that part at any time for replacement. You must have purchased the original part from eEuroparts.com®. We will not provide a replacement or credit for any part not purchased directly from our store. This warranty is not transferable. Only the original purchaser of the part can receive a credit after they have purchased a replacement. You must purchase a replacement part at the current price for that specific item prior to receiving any credit. You will be credited for your original invoice amount, less any discounts received. This warranty does not cover any shipping costs. If a part is not eligible for Parts For Life™ it will be noted prior to purchase and additionally noted during the returns process. If the original part is no longer available from eEuroparts.com®, we will provide a credit of the original invoice price after any new purchase of a suitable replacement part has been made, totaling the same or higher amount of your original purchase (excluding core charges, shipping, or discounts). If the original item or suitable replacement part is not available, then this warranty is void. eEuroparts.com® reserves the right to modify the conditions of this warranty at any time for any reason. eEuroparts.com® proudly offers wholesale prices and fast shipping available on most orders. We also provide inexpensive and guaranteed 3 day, 2 day, and Overnight shipping options, so if you need your A/C O-Ring (10 x 8mm) tomorrow, eEuroparts.com® can deliver! Every eEuroparts.com® order is track-able, meaning you'll know exactly where your A/C O-Ring (10 x 8mm) is at every step of the shipping process. eEuroparts.com® also displays your Expected Ship Date and transit time in your Cart, making our entire shipping process simple and transparent. eEuroparts.com® proudly offers a ninety (90) day cash return for all items purchased through eEuroparts.com®. The item must be new and in its original manufacturer packaging to be eligible for a cash refund. If you would like to return an item or have questions about the process, please contact us and one of our customer service experts will be happy to help. This information is only a summary. Complete shipping and return policy information can be found in our web site policies.